1) Tea Set Necklace - Sometimes craft stores have interesting jewelry, at low prices, too, since they have a lot of sales. This tea set was intended for a bracelet, but I strung it up on a gold necklace chain instead. 2) World Market Bamboo French Press - I'd been thinking of getting a French press: I like to drink coffee sometimes but not every day, maybe about once a week. So using this instead of having to get out the coffee machine from its hiding place in a cabinet is much simpler. And coffee machines get dirty easier, don't they? You rinse them out and run a cleansing brew through, but they just don't feel new anymore after a while. The French press is simple to keep clean and to use and of course I love that there are no filters to throw away. Because you can see the coffee brewing, it's easy to brew it a little darker or a little lighter depending on your tastes--and it makes it more like brewing tea. I finally got this French press because I liked the bamboo on it: woodsy materials always win me over. 3) Abeo Brittany Sandals in Tan/Brown - Another thing I'd been planning to get was a pair of sandals for summer, some that actually provide foot support. I don't want to have to buy comfort shoes when I'm older because my feet, knees, and back hurt--I want to start buying them now so that my feet, knees, and back don't get so abused. The problem I run into, though, is that many of the comfort shoe brands make wide shoes and I have thin feet. The salesperson at The Walking Company was a great help, though, and pointed me out to brands that would fit me better. So I got this pair from Abeo. They're in that basic style that Birkenstock makes--but Birkenstocks are very wide and Abeo shoes are narrower. So they fit great. And they're in this nice light tan color (almost with a hint of rose) that fades away when I'm wearing them, so I can wear them with shorts or dresses and any color outfit. 4) Equal Exchange Earl Grey - I'm still enjoying Equal Exchange tea (I don't know where else to look for good quality, organic, fair trade, loose, preferably bulk tea). Though I don't get Earl Grey as often anymore (Darjeeling is my favorite, though regrettably none of the stores I go to carry Equal Exchange's Darjeeling), this one is pretty good: you can still taste the flavor of the tea alongside the bergamot. I almost want to call Equal Exchange's tea malty in flavor: it's rich and flavorful and rounded and smooth and deep. 5) Straight Hair - I mentioned in my OOTD post that I've been liking my hair straight again instead of just curly. I think it's finally gotten to that nice and long length where straightness looks good; before maybe it was at too in-between of a stage. Or maybe the cut was a little different. Only thing is, with the weather warming up, I'll be letting my hair air dry with curl cream soon--so I'll have to say goodbye to the straight hair for another season. 6) Bella Grace Magazine - I happened on this one at JoAnn's Fabric. Now, I've never been into all the little signs and quotes about "today is a happy day" and "be all you can be" and "I see rainbows everywhere I look." (I don't mean to be rude: if you like signs and quotes, that's cool. I just don't like them.) But I do believe in positivity. And I like pretty things. This magazine is exactly the kind of positivity I try and seek, the kind that acknowledges imperfection and is about living your whole life and not just pretending that everything is good or should be perfect. It has articles by different people saying something about some part of their lives, or something they've discovered. And there is beautiful, nature-inspired, feminine yet earthy photography to accompany the text. One woman talks about the beauty of worn quilts: they're worn because they have been well-loved and used. Because of its philosophy, this magazine is beautiful--and its images and its writing are likewise beautiful because of what they are expressing. 7) Blending Perfumes - Most of my perfumes are floral-based, often just a single flower. And many of them are from Anthropologie or similar stores. They're perfumes that cost less than the department store brands (Dior, etc.) but also don't last as long. Two hours later and I can't smell a lot of them anymore. So I started experimenting with layering on more--also because I seem to have collected more perfume than I can wear. I've combined Vanilla (which is something I never wore, I just liked the smell of it) and Rose, Rose and Honeysuckle, Rose and Violet, and so forth. The perfume still doesn't seem to last any longer than when I use just one, but it's fun to blend them and it creates some new scents without going out and buying more. 8) Kylo Ren Figure - Kylo is unmasked! And reunited with his beloved grandfather. Now I just need to get Rey. 9) Witch Hazel as After-Shave - Not a new product, just a new use for it: I've been using this witch hazel toner for years now (it's the best thing for your face, it's natural, it's inexpensive given how long it lasts and compared to other products, and it smells nice--they make other scents, too, and a plain one that's alcohol-based for men). Anyway, on recommendation I've also stared using it after shaving, and I think it does help with keeping your skin from getting irritated. The bottle actually doesn't say anything about using it specifically for your face, anyway; it just says it's for your skin. Side note: I think the packaging design has changed since I last bought any. 10) Star Wars Rebels - This show started out good but it's has some great moments. The Season 2 finale last night was deep and dark and amazing. Definitely more than just something to tide you over in between movies; it's great on its own, too. Camp Verde has a few events throughout the year. I usually try and go to Fort Verde Days in September or October, but that's about it. A week and a half ago, though, I went to the Pecan and Wine Festival, just to go. And what did I find there? Chocolate, my friends, chocolate from Arizona. Untamed Confections is based out of Tubac, which is way on the southern edge of the state--about an hour south of Tucson. In fact, it's far enough away that I'm honored they brought a booth all the way up to central Arizona. Side note: they also keep a kiosk in Bisbee (a historic town a couple of hours east of Tubac, or south of Tucson--it's fairly close to Tombstone, and I hear it's more authentic and less touristy than Tombstone). The edge to Untamed Confections is their use of honey as a sweetener instead of sugar. While I'm not personally opposed to using some sugar, I'm also all for replacing it with honey. (There's a chocolate I've been seeing around that's sweetened with stevia--and I've been refusing to try it because I don't really see the point.) Honey is delicious, healthy, and environmentally friendly; it's one of those perfect foods (just ask John the Baptist--and honey is much more approachable than locusts). In addition to the use of honey, their confections are made without artificial ingredients. The plain chocolate has just three ingredients: organic and Fair Trade chocolate made with Peruvian cocoa beans, unfiltered Sonoran Desert honey, and organic vanilla. They work with beekeepers in the area to obtain their honey, noting that these beekeepers keep their bees away from areas with pesticides. I forgot to ask if they make their chocolate from the bean--and if they source it themselves. 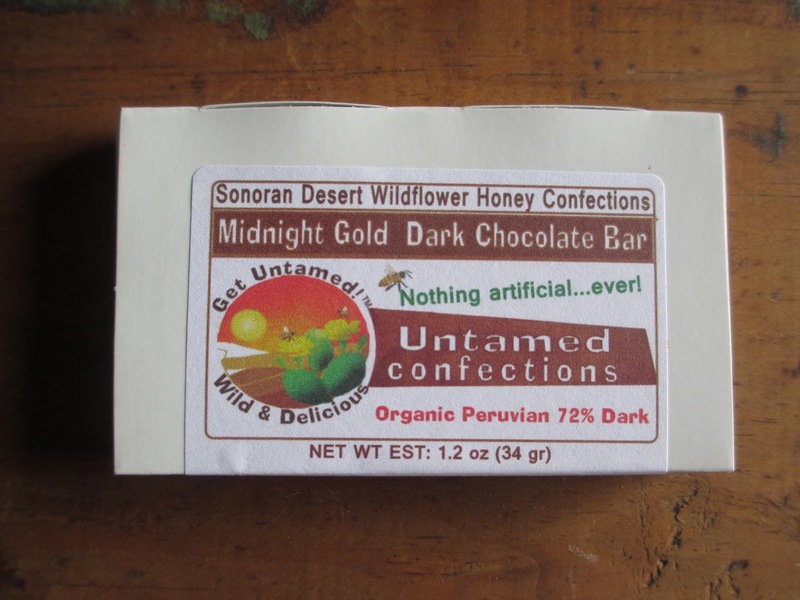 The look of the Untamed Confections packaging is quite basic (they call it earth friendly and biodegradable). In fact, for the company's tagline being "Wild & Delicious," this is rather tame packaging. Not that I mind: the look is also handmade and local and small business-like, which are all positives. The white box is the only thing protecting the chocolate (no wrapper or foil), therefore the chocolate only lasts about six months (about half the usual time, if I'm not mistaken)--but why do you need it to last for a year, anyway? This little 32 gram bar came in at $5, which is on the expensive side, yes, but good chocolate and good honey both come at a price. I'd imagine the honey alone marks up the price a good amount. At the festival, they were giving out samples at their booth. So I did get a chance to try this chocolate before buying it. Sadly, I think they weren't getting much business: maybe it was just too early in the afternoon? If they were in Flagstaff, though, I bet they would've sold out. Sigh--different markets. The little chocolate bar is as cute as its box is simple. A smooth surface (glossy at just the right level) with a thin border proclaims "Get Untamed!" and holds a tiny bee on one of the letters in homage to the bees that made the honey to sweeten this chocolate. It's well-molded, with just a couple of tiny air bubbles. Interesting, though, are the slightly raw edges on two of the bar's four sides. 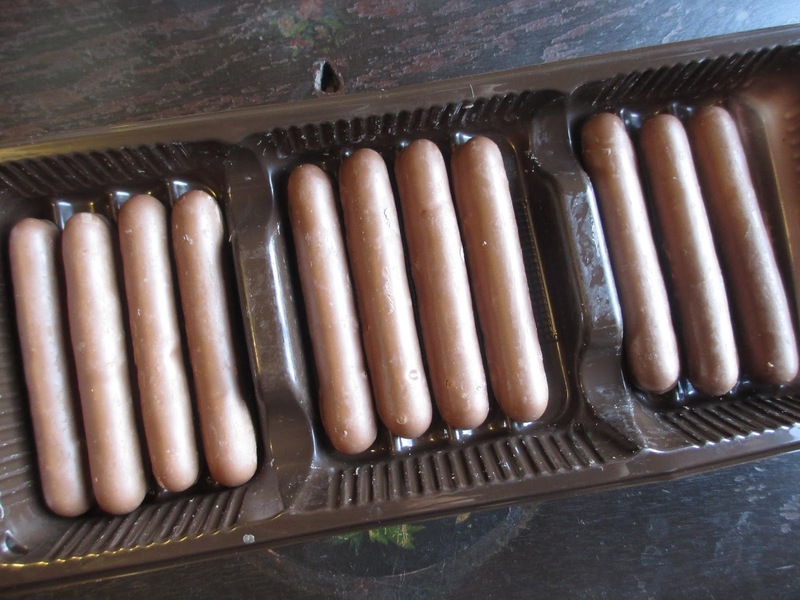 It looks as though these bars are made in a mold that holds at least four of them, then broken apart into individual rectangles. The chocolate has a great snap to it and a consistent look on the inside. The texture is singular. When I tried the sample (since it was such a small piece), I thought it might just be a slightly dusty texture. But when I try it again at home with a bigger piece, I'm reminded of raw chocolate. Raw chocolate has a softer, almost crumbly texture that varies depending on the company and the techniques they use (some are willing to heat the chocolate more than others are). Untamed Confections doesn't say anything about raw chocolate and I'm not saying that it's quite that exact texture. It's just a little reminiscent of it: it's a little softer, a little less silky, a little less prone to crumble and therefore more a chocolate to munch on (versus letting it slowly melt away). This texture can make the chocolate feel more dessert-like--and therefore suitable for more types of sweet cravings. Speaking of sweetness, let's take about the sweetness level of this chocolate. The cocoa content is 72%, a nice average dark chocolate percentage. It's neither sweet nor bitter nor flat nor full of flavor notes. So the sweetness is at exactly the right level, enough to balance out the chocolate and yet not taking over. I wouldn't say that I taste honey--but there is a sense of something different from usual, something more food-like and less-processed (this should not be taken to mean that this chocolate tastes like a health food, which it certainly doesn't: it just takes more real). 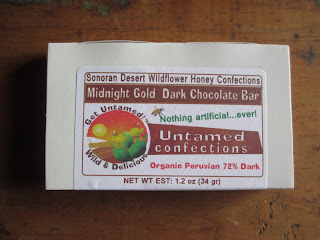 Untamed Confections also makes flavored chocolates and caramels and honeymallows and other confections, including the Salted Desert Tortoise (pecans, honey vanilla caramel, and chocolate), which I rather regret not buying when it was right in front of me. They do sell online, too, if you're an online shopper. And if you've been looking for a chocolate sweetened with something other than sugar, having this one shipped to you will be worth it: the taste is good and addicting. I've been thinking about Primeval so much lately. Maybe it's because it's spring, the time in which I always seem to discover new TV shows. I still haven't started my rewatch of the series, but I have been letting the fashion inspiration come back in. When I was in college (which is when I started watching the show), I used to dress like the characters all the time. Connor most often, but sometimes also Abby, Jess, and Helen. I once saw a jacket at Ross that reminded me of Cutter and so I really wanted it--but I wasn't there looking for a jacket, so I had to leave it be. Cutter always wore the same type of jacket, so there isn't really any way of dressing like him unless you have a jacket like his. Connor is much easier. Layers are the biggest thing about Connor's outfits (not including the simpler look of Seasons 4/5). So here's how I channeled my inner Connor Temple this past week. Connor often wears colored pants, so I wore my matte gold Free People pants. As a graphic t-shirt, I have a Mickey Mouse shirt that I usually (or always) just wear around the house; it's perfect for this outfit because you can just barely get a hint of it underneath the top layer. 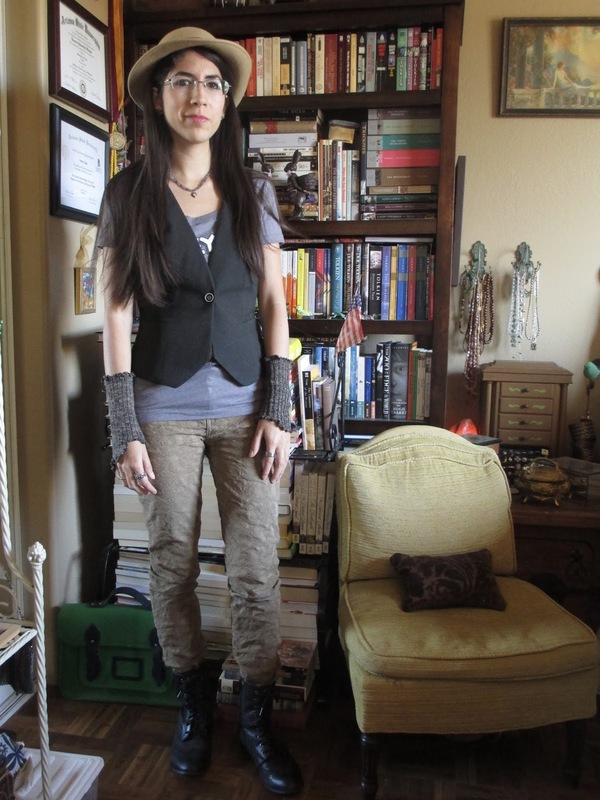 The top layer is, of course, my vest: vest, fingerless gloves, and hat are Connor's trio. My vest is a black Antonio Melani piece that I was so excited to find a couple of years ago on sale and in my size. The gloves are the handmade ones from my favorites post last month. And the hat is from my vintage collection; it has an orange ribbon and feather and I actually can't remember for sure which antique store I got it from. Probably somewhere in Prescott. The boots are my old Aldo ones, and the amethyst necklace is another antique store find. I wore a dusty purple eyeshadow and a pink lip color. As a nod to Primeval, I chose my vintage silver, pterosaur earrings. A little less colorful than some of Connor's outfits, this one reminds me more of what he wears at the beginning of Season 2, the episode where the raptors are in a shopping mall. Simple, with neutral colors, and that fitted black vest. Easter has always confused me. Most holidays are a mixture of sources, traditions, and meanings--but usually I know which of these I celebrate. Christmas, for instance, is for me a pretty seamless blending of tradition (the presents, lights, and trees) and meaning (the Christmas story). But I don't know what Easter is to me. It's all of the pink and yellow, the bunnies and the baby chicks that throw me off. There is a part of Easter that seems like it should be more serious than other holidays (the death of Christ); but then there is also an extremely celebratory and joyful aspect (the following resurrection and the salvation that comes with all of this). So I suppose it makes sense to me when people take Easter in two parts: the serious time beforehand and then the celebration on Sunday. But that's usually more Catholic; Christians usually just celebrate Easter Sunday. By celebrating, there's usually just a special church service, people have friends or family over for dinner, and children get candy. In a way, none of it seems big enough for the grand scale of what the holiday means--as if you might as well not even have it be a separate day, but just something that you think of all the time. And if I try and consider the less meaningful side of the holiday, I love candy, but I don't really need a holiday that's just about candy--and all the Easter decorations are too pink for me (I have a pair of chocolate bunny figures that, even though they're just brown and I do like them, I already can't wait to take down tomorrow). So that leaves me wondering how I celebrate Easter--or if I even really celebrate it at all. I guess I didn't grow up with specific Easter traditions. As children, we would get Easter eggs and candy. But I'm not a child anymore, and I can buy candy whenever I want. As far as church services, it's always been like this: if I'm going to church when Easter comes around, I'll go to their Easter service--but if I'm not, I don't go to one. I happen not to be going anywhere right now. How can someone become obsessed with a musical they've never actually seen? Quite easily, apparently. Back around 2007 or 2008 or somewhere around there, I was pretty obsessed with The Lord of the Rings Stage Production (I call it a musical usually, but even though it had music and songs, it wasn't exactly called a musical). I would watch the official clips on YouTube, trying to imagine how they all fit in together and to picture what it would be like to watch from the audience. Eventually I bought the soundtrack (at least that was available to me), and I've continued to return to it, usually having to listen to almost every track (even when I had thought to just listen to one or two). Those songs have stayed living in my head over the years, and I never gave up on the possibility of seeing the production live: there was talk about a world tour in 2015. But 2015 came and went and there was no world tour (I'd been hoping they'd do a stop in LA that I would be able to go over for); I think the rumor is that funding held them back (it was a pretty expensive production, and one with large sets and a crazy stage that would be difficult to move around). I did, however, get the next best thing. I got the companion book. I'd been wanting it for some time, and finally when I got a gift card for Christmas, I knew what I had to spend it on. So much time has passed that unless you want to spend lots of money, you have to get the book secondhand--but I was able to get a nice copy that's as good as new. So I'm very thankful. It's quite a nice book, too. A sturdy hardcover, it's designed to look like leather, with the production's blue logo up on front. There are lots of pictures, too, which was one of the major draws for me. I took my time staring at them all (which is one of the reasons why it took me so long to get through this book), and they filled in gaps of missing scenes that I had never seen from the video clips. The way the book is divided up, there is a lot of space in the beginning devoted to the technical side of trying to get a production started. While all of this was interesting, I have to admit that it dragged on a bit long to me--especially since I was reading this book to try and get an idea of what the show was like. So I wanted to hear more about the plot than about how they found the producers (usually I want to hear less about the plot and more about the making of, but this was a special situation). That said, the degree of detail that this book goes into in a mere 150 pages was something. I'm less familiar with how stage productions are put together (I read more about movies), so this was all interesting to learn about. And the commentary on the music was one of my favorite things to go through: this production had such a specific musical style that's quite unlike anything else. Then there is all of the talk about that amazing moving stage, the stilts and such, the lighting, the costumes, etc. What a show this was. I regret even more now that I never had the chance to see it. Yet this book let me almost pretend that I got to see the show. I saw so many more images of it ("Is that what the balrog looked like? It's terrifying," I thought as I turned the page to see the creature of flame and shadow), so many more glimpses into the imagery. Even from still images, I got an idea of movement, of what the choreography was like and what the lighting was like (wow, the Fords of Rivendell must've looked amazing). And all through it all, the songs I long ago memorized were playing in my head. I'm in awe all over again, and I'm transported all over again. So I was in Las Vegas last weekend for a wedding (a wedding in the close family). And while I was pretty busy most of the time, I did want to make time for two stops: Jean Philippe Patisserie in the Bellagio and Hex Chocolate in Paris across the street. Quite frankly, this was perfect because this area was exactly the area that I spent the whole time in, so I didn't have to go out of the way for the two chocolate places. That said, I wasn't able to go to Jean Philippe until Sunday morning. We decided to get crepes there for breakfast, along with some sandwiches to take with us for the drive home. The sandwiches were good, but the crepes were delicious. I chose the souffle crepe, which has a cream filling and comes with either berries, chocolate, or something else (I can't remember what) on top. I chose chocolate, of course. Very good. The chocolate, the cream, and the crepe itself were top notch. I took a chocolate croissant for later, which was also good. Now let me talk about how the store works. It's an open store, a sort of alcove within the elegant Bellagio halls. No doors and no defined entrance or exit. Lots of displays and things to look at, including their "world's largest chocolate fountain" that held absolutely no interest for me (and therefore I deliberately didn't take a picture of it). There are two registers but depending on the time of day, only one of them might be open. The middle of the store area holds the registers, one on either end, and a big counter where they keep the gelato, desserts, and pastries. The line is right up against this counter, so you can look at everything while you wait. On the walls are shelves filled with beautifully decorated cakes, seasonal displays, and chocolates and candies for sale. The more standard for sale items are on regular shelves so that you can take whatever you want to the register (there were a lot of Easter eggs when I was there). But on one wall were glass cases with locks on them that held the chocolates and truffles and macaroons. Inside these cases, signs say to ask for assistance. But in a store where you only speak to employees at the register after you've waited in line, when exactly are you supposed to ask for assistance? Since I was hungry (how can people skip breakfast? I start to feel sick if I wait too long to eat), I decided to think about the chocolates later. So that meant that when I came back later, I had to wait in line again. Someone asks for your order just before you get to the register, so I asked her for the chocolates from the case. And here is where I realized that hardly anyone buys from the case. It's possible that she was a new employee, but I got the idea that it was unusual for them to have to unlock the case. She walked over with me to get out what I wanted. I had made a list of the flavors I wanted, even though I didn't see all of them there: I figured that they must keep them elsewhere because why would there be such a big list of their flavors if they only had a few available at a time? I was wrong. They only had the flavors that were right there, and only one from my list was available. So I had to quickly look and decide on other flavors I might want instead of the ones I'd chosen. Maybe this was my fault, but I still found it odd. So. The woman took my bag of chocolates back behind the counter and continued to take people's orders. And I wondered what I was supposed to do. I'd already waited in line. So I stood sort of by the register, not quite in line but almost. And when the people at the register were done, I quickly went over and asked if I could pay for the chocolates--because I don't think they were going to call me over to pay (they take your name when they take your order, but they never took my name since I didn't really "order"). I think I would have just waited there forever if I hadn't gone up myself. So they definitely need a better system for buying the chocolates out of the case. As you can see in the pictures, there were some boxed chocolates. But the displays didn't mention exactly what was in them (and it's possible that the employees wouldn't even have been able to tell me). So I just chose them individually; this way, they come in a bag like the kind they put pastries in. There were also round truffles, but they were in a separate case with its own lock so I, frankly, just didn't want the bother of having to ask for two cases to be opened (do you see how much I hated those cases?). The chocolates are nice-looking. But I get the impression that they looked better when they were freshly made: they're just slightly scuffed-looking. Being loose in a bag doesn't help much, and neither does sitting in a case for who knows how long. If hardly anyone buys the chocolates and if they were already out of most of the flavors, maybe these had already been there for over a week? (Fresh chocolates, as you know, last about two weeks.) Anyway, here is what I ended up with. Crunchy - Plaid top with orange - "Milk chocolate waffle praline, milk chocolate coated" - (Wasn't on my list.) This is the only one of the four to have a lighter-colored center. It smells nutty and has a nice, light crunch. However, it has a weird flavor to it. Sure, that flavor mellows out some once the nuttiness and a hint of milk chocolate come in--but why is it there to begin with? If it were some kind of different nut that I'm not used to eating, it would just taste different, not odd and bad. Is the chocolate old, maybe? I don't know, but I didn't even finish this chocolate. Rustic - Crumbles on top - "Crunch praline gianduja ganache, milk chocolate coated" - (This was on my list.) A dark ganache in this one, and it tastes really good, creamy, nutty, chocolaty--like a pastry creme. Just that slight bit of crunch is there on top, otherwise everything is smooth. If you like hazelnut and milk chocolate (gianduja is hazelnut chocolate, by the way), this one is perfect for you, as it was for me. It melts and disappears quickly, but it's pretty good. I can't get a sense of the chocolate on its own. But I can say that it doesn't taste greasy, which is definitely a good thing. Cool - Dark chocolate with green and yellow stripes top - "Fresh mint-infused ganache, dark chocolate coated" - (Not on my list.) Also a dark ganache here. Once again, it's a very smooth ganache. So you're enjoying that smooth chocolate and then suddenly the mint hits you--I mean really hits you. It's strong and fresh, like when you pull off a mint sprig and put it in your mouth. I hardly ever taste mint like this in chocolate, so it's almost too strong (not really, I'm just trying to describe that particular taste of mint that I come across less often in chocolate). You can still taste the chocolate; the mint doesn't overpower it. They're still a team. So this is one for the mint fans, for sure. Again, you can't really get a sense of the chocolate's specific flavor or quality on its own. Caramel - Orange rectangles with thick red stripes on top - "Salty buttered caramel ganache, dark chocolate coated" - (Not on my list.) This center is slightly lighter brown; it looks like another ganache but then you bite in and it is a caramel, after all. A very good textured caramel, too--not free-flowing at all but not at all stiff. It stands on its own but it isn't stiff--that's very cool. And it tastes wonderful. Yes, like the butter, though not too salty. The expected caramel flavor is there, but more fragrant and soft and . . . present. Dark chocolate is only on the sidelines, just adding a little something to richen it up. I'm kind of surprised how good this one is--and to think that I wasn't even going to get it. I should have known that a patisserie would make good caramel. I think it's actually my favorite. Probably one of the best, if not the best, caramels I can remember coming across. So thanks for showing me that caramel can be done really well. Obviously I have some mixed or otherwise complicated feelings toward Jean Philippe Patisserie. It's a beautiful spot, worth stopping in. As far as the chocolates, they were generally good. Caramel is my favorite, followed by Rustic, then Cool, and Crunchy was just kind of weird. The chocolates are worth checking out--but then again, they also make such good crepes and pastries (and probably desserts, though I didn't get to try any--oh, and I would expect the gelato to be good, too) that you might not really be missing out if you don't get any chocolates. And it'll certainly be easier not to get anything from those cases. If I went again, I would probably get a dessert instead of chocolates or truffles--or maybe just one of the packaged chocolates that you can get off the shelf yourself. If you do get the chocolates, probably try and get the ones that are more related to the world of pastries--that's what this place seems to do well and that's why the Caramel was my favorite. Quite frankly, even after eating the chocolates, it's still the flavor of that chocolate souffle crepe that I have in my mind; it was the best. I feel a little guilty for missing Disneyland when it hasn't even been a year since I was last there. But that's just how Disneyland is: it gets into your mind and becomes like another home, a place you instantly feel at ease in and a place that you remember . . . in every detail. When I was homesick for Disneyland, I used to sit in my closet (I had a little step-stool in there, so sometimes I would just sit there and read; obviously I'm not claustrophobic) with my headphones (and CD player, I might add) while listening to the Disneyland soundtrack. The Space Mountain track was my favorite, because I could close my eyes and imagine I was on the ride; I would picture all the twists and turns and changes in speed and it was almost like being there. I don't listen to the soundtrack as much anymore (though I almost never skip Walt Disney's Dedication of Disneyland when it comes up under shuffle). What I do now is incorporate Disneyland into little moments of my daily life when I need it. I have the place so memorized that sometimes I just imagine walking down Main St. and seeing the lamp on above the fire station, or looking out over the lagoon in Tomorrowland, or catching a glimpse of Matterhorn when the doors open on the Tower of Terror. Just for a second, I picture that I'm there--and it makes me happy, it makes me feel like even if I'm not there, Disneyland still is--and that is good. I don't always know why this place has such power, not just over the time that you spend there but also of the time that you are away. Part of it is memories: we make a lot of good memories in Disneyland. But when I think about Disneyland, I'm not always thinking about the memories. Sometimes, yes. Sometimes I think about the time we had a contest drawing pictures of Disney characters while waiting for Fantasmic, or when we all went through every tunnel together on Tom Sawyer Island. But these are times of family and friends (and don't get me wrong, I definitely treasure these times). Other times I just want to think of Disneyland, of the place and of the symbol it is. And because I am so strange, I just had to dig out a sonnet I wrote about Disneyland for English class during freshman year of high school. I mean, what is a fourteen year old supposed to write a sonnet about? So I tried to just do something silly and fun. I share with you the results (I got a perfect grade on it, by the way). I feel my journeys there coming to mind. or beneath the hot rays of summer kind. I find myself near pleasure to abide. and far from the worries of Outside. Even for one day of jubilation. to make it seem, though not, the perfect place. the wondrous results of their hard work's pace. This splendid place of Disneyland the fair. You see what I mean? I didn't talk about any of the "details." All I talked about was the idea of Disneyland. And sometimes it's just the idea of Disneyland for which I am homesick. Sometimes, as desperately as I want to ride the temporary Star Wars version of Space Mountain or go get a mint julep in New Orleans Square before getting in line for Splash Mountain, all I really want is to ponder the idea of what Disneyland was, is, and will always be. Did I just name this post a haul? I must be watching too many YouTube videos--probably because I had fallen months behind in my subscriptions and finally finished catching up. In Prescott Valley, there is a thrift store right off of the 69 (if you know the area, you'll know which one I mean). They have a room (or two small rooms is more like it) to one side filled with bookshelves. And here's the best part: except for a few that are marked differently (a very few), they're all $1 for hardcovers and 50 cents for paperbacks. Much lower prices than Goodwill's--and they have a bigger and often more varied selection than Goodwill's. So it's turned into my favorite place to get used books. Used books are interesting. Sometimes you just find piles of books that were made into movies recently, and there are always plenty of cheap trade paperbacks (you know, the romance novels and such). But sometimes you can get books inexpensively that generally cost a lot more (like classics that you kind of want to read but don't want to pay for) or just random books that you really enjoy but wouldn't have happened across in a new bookstore. So I thought you might like to see what books I got there. First we have a pink, clothbound book without its book jacket. 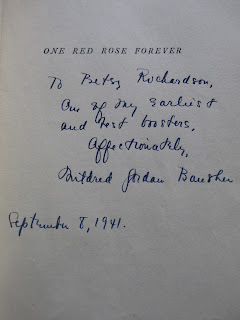 One Rose Forever by Mildred Jordan, publication date 1941, first edition. And it's signed (the store has a separate shelf for signed books, but this one wasn't on it: either they didn't notice or didn't think it mattered). I don't really know what this book is about, but its cloth and title interested me, as did the fact that it's signed. I just hope it isn't a romance (love story, fine, but romance, no). Next is a discarded library book (it's marked Phoenix Public Library). Dust Is My Pillow by Phyllis Hastings, 1955, first edition. I liked the title. The summary sounded interesting, something about people on a farm, and the bits of writing that I read from the inside looked good. Then we have some classics. Tess of the D'Urbervilles by Thomas Hardy, the 1995 edition by Courage Books. It maybe isn't the most preferable edition, but it's hardcover and in good condition and the paper is good quality with nice sized print. So it's really not bad. I've been thinking of reading this book, so for $1 I might get around to it. I keep collecting Willa Cather books as if I like her, even though I've never actually read one of her books. But I think I'll like her writing, so I keep buying them. This one is Death Comes for the Archbishop, the 1995 edition for Quality Paperback Book Club (a label I'd certainly never heard of). It's a pretty edition, not too worn for being a 21 year old paperback, and the book takes place in New Mexico. Then we have a short story collection, Interpreter of Maladies by Jhumpa Lahiri, 1999 by Mariner Books. I read a little from Jhumpa Lahiri in one of my college classes, and I really liked her style, so I was pretty excited at the chance to read more from her. The History of Rasselas, Prince of Abyssinia by Samuel Johnson, 1985 Penguin edition. This, unless I'm mistaken, is the book that Helen is reading in Jane Eyre, the one whose title sounds interesting to Jane until she discovers it isn't a fantasy story. As an oddity, I thought it might be fun to see what it's like (it isn't very long). Other Victorian writers reference Samuel Johnson, too, after all, so it's another way of looking at things to read what they read. Last is a book of poetry, The Poplar Tree by Clara Emily Guion Aguirre, 1988 by Nightjar Press. 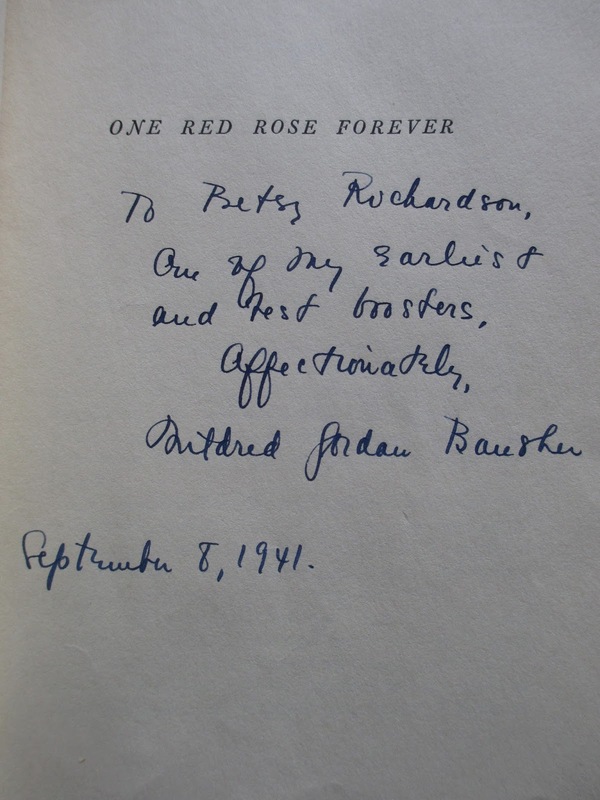 It seemed like a nice book to me, with sprinklings of nature and sweetness and yet not at all cloying or fake or dull. Then I saw in the author bio at the back that the writer was raised in New Mexico. Ah. New Mexico is wonderful. The book comes with me, something that perhaps few others would consider but something I'm so grateful to happen upon, something I wouldn't have found elsewhere. That's seven books for $5. Primeval (that wonderful British sci-fi show that ran from 2007-2011) is stalking me again: suddenly everything is coming up again to remind me of it and to make me homesick for it. (I'll watch it again soon . . . I'm just a little busy right now.) Milka reminds me of Primeval because it's a Milka bar that Becker brings back for Jess in one of the episodes. And Milka bars are pretty good, too, when you just want a sweet milk chocolate. I've been trying out some of their cookies lately at World Market. The cow-shaped biscuits with chocolate on one side (I forget what they're called) are good, but these are my favorite so far. Lila Stix come in Milka's usual purple coloring. 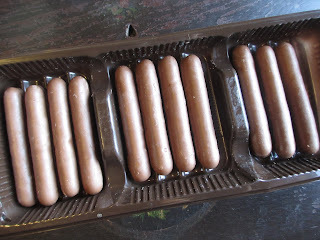 A brown tray is designed to hold the sticks in place, but I found nearly all of them off to one side, piled on top of one another. Not particularly pretty--but they're just casual cookies, after all. They're just cookie sticks dipped in milk chocolate; pretty simple. Reminiscent of Pocky, though not so thin. I happened to be craving a little something sweet when I opened the bag one night. I ate one. And then another. And then another. And I just kept eating, saying that I could finish the whole package. So I ate half--because I thought I might want to do a review since I was enjoying them so much. That means that now I have to try and explain why these cookies are so eatable. They're not really that much like Pocky. That slight extra thickness distinguishes them, making them in fact less like sticks but more like slim biscuits or cookies. What they remind me most of is Twix. A thin cookie covered in chocolate. Twix have caramel and these don't, but the biscuit part is sweetly flavorful enough that it almost has a slight caramel taste to it. And Milka chocolate has some caramel notes of its own, anyway. So Lila Stix are sort of like Twix--only better. The chocolate is better (as far as chocolate in candies and cookies goes, of course). And because there is no caramel to slow down the eating, the crunch is better, too. Like with Doritos, where you think the taste is what matters but it's really the texture, Lila Stix are about texture. The cookies are soft and crunchy, just enough softness to blend with the chocolate and just enough crunch to make you want to keep eating and eating them. And that's exactly why I didn't want to stop. Other than that, though, there is nothing more to say. They're just cookies, casual cookies, nothing special--except that they're good to eat. Yesterday morning, I flipped my calendar over to reveal this charming picture for March. February was pink and pretty with a peacock with flowers in its feathers. March, however, is dark blue with curly serpents whose scales are are turning into leaves. I tried to think of how pretty the swirls in the snakes were (I don't like snakes to be used as a symbol only of evil, after all), but honestly I was a little frightened of the image: March is when I start watching out for snakes (this is Arizona, remember), so it was as if the calendar was telling me that the time of danger had come. That got me thinking about irony. Last night I decided that today's post would be about the irony of springtime and snakes. Spring is supposed to mean the coming of life after a winter of sleep and bareness. We all feel more alive when winter starts to fade. Plants come out, the sun comes out. And snakes come out. Now, snakes certainly aren't evil and they're in fact helpful in many ways (Do you like rodents running all around? No, I didn't think so). But you have to be on the lookout because most people who got snakebites got them because they didn't see the snake; they either stepped somewhere or put their hand somewhere that they couldn't see. So in order to avoid that, you have to carefully watch where you're going (snakes blend in so well). And therefore springtime, with all of its life and happiness, comes also to mean the time when you have to be on your guard against frightful bites (yeah, people don't really die of snakebites anymore, but they hurt and can put you in the hospital for a bit, too, depending on the details). Before I had the chance to write my post, though, guess what happened? We found the first snake of the season. (Usually we don't find one until late summer.) It was a little gray one with spots or other markings. I'm not quite sure what it was, if it was a baby or just a small snake. I have a couple of possibilities, some more and some less harmful. It's gone now. But it startled me a little: it was in a place I walk through twice a day, a place where I could easily have bothered it without seeing it. That memory is all gone, but this image remains . . . The calendar page, with the two swirly snakes staring in each other's faces. March, the beginning of springtime and the beginning of snaketime. Lovely, no?